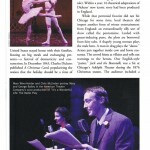 This article by Robert Loerzel originally appeared in Playbill magazine in December 2011. It’s December. Everywhere you turn, the lights twinkle. Christmas carols jingle. And Ebenezer Scrooge, George Bailey or maybe a department-store elf called Crumpet are center stage once again. For Chicago’s theaters, the holidays have always been an important time of year. However, the concept of Christmastime entertainment hasn’t always been the same. Playbills and newspaper clippings from the 1800s and early 1900s strikingly reveal how few of the December shows had anything to do with Christmas. People celebrated the holiday season by attending tragedies like Hamlet, romantic melodramas, vaudeville variety revues, operas or even blackface minstrel shows. While the idea of going to a theater on Christmas Day itself might seem strange today (surely those actors deserve a day off), it was a common ritual for Chicagoans in the 19th century. 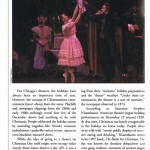 Newspaper articles from the 1860s and 1870s describe thousands of people filling the seats of Chicago theaters at matinees and evening performances on December 25. The Chicago Daily Tribune suggested that the city’s residents didn’t have much else to do on Christmas Day, so why not spend some time at the theater escaping from their “tiresome” holiday preparations and the “dreary” weather? “Under these circumstances the theatre is a sort of necessity,” the newspaper observed in 1874. 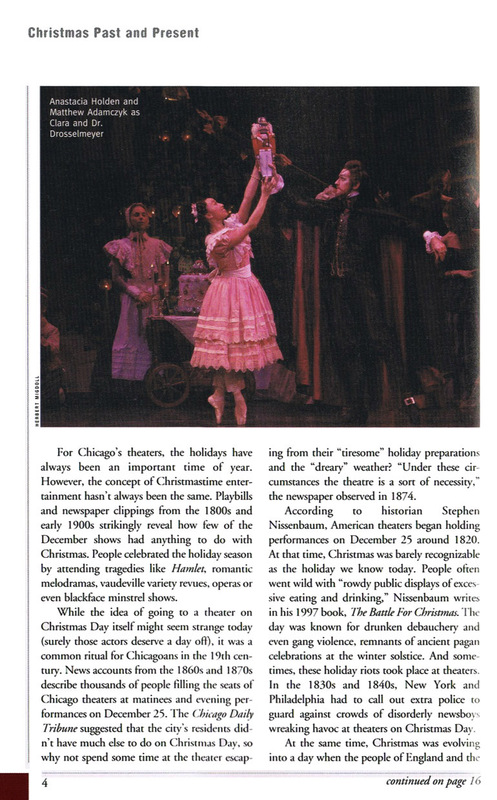 According to historian Stephen Nissenbaum, American theaters began holding performances on December 25 around 1820. At that time, Christmas was barely recognizable as the holiday we know today. People often went wild around Dec. 25, with “rowdy public displays of excessive eating and drinking,” Nissenbaum writes in his 1997 book The Battle For Christmas. The day was known for drunken debauchery and even gang violence, remnants of ancient pagan celebrations at the winter solstice. And sometimes, these holiday riots took place at theaters. In the 1830s and 1840s, New York and Philadelphia had to call out extra police to guard against crowds of rowdy newsboys wreaking havoc at theaters on Christmas Day. At the same time, Christmas was evolving into a day when the people of England and the United States stayed home with their families, feasting on a big meal and exchanging presents—a festival of domesticity and consumerism. In December 1843, Charles Dickens published A Christmas Carol, popularizing the notion that the holiday should be a time of good will toward all men. A few months later, three different stage versions of A Christmas Carol premiered in London on the same night. (The fact that it was February didn’t dissuade the theaters from staging Dickens’ Yuletide tale.) Within a year, 16 theatrical adaptations of Dickens’ iconic story had been produced in England. Another type of show that was popular during the holidays in Chicago was the “spectacular”—a string of largely unrelated songs, dances, scenes and sketches. People were wowed by the pretty scenery and costumes. In 1890, the brand-new Auditorium Theatre hosted a Christmas spectacular, including a “dance of the nymphs and rabbits” and an “insect ballet,” with dancing girls fluttering their arms in the air as they imitated bugs. 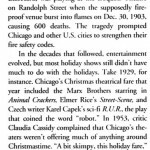 Another holiday show of this type, Mr. Bluebeard, was playing at the Iroquois Theatre on Randolph Street when the supposedly fireproof venue burst into flames on Dec. 30, 1903, causing 600 deaths. The tragedy prompted Chicago and other U.S. cities to strengthen their fire safety codes. It’s debatable whether letters to Santa got the job done, but more Chicago theaters eventually began presenting holiday entertainment. 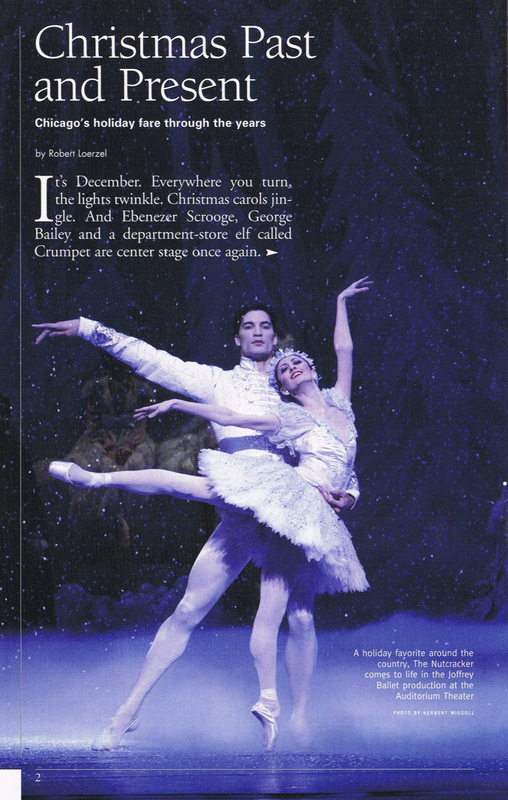 After choreographer George Balanchine reinvented the ballet of Tchaikovsky’s The Nutcracker in 1954, it became a December staple for dance companies. 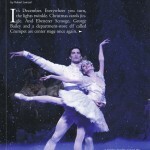 Those sugar-plum fairies and mice have been pirouetting since 1996 at the Auditorium Theatre in another version, by Robert Joffrey and Gerald Arpino of Chicago’s Joffrey Ballet. 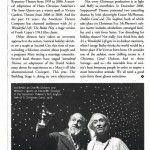 A Christmas Carol debuted at the Goodman Theatre in 1978, and it was an immediate smash hit, ensuring its annual spot on the theatrical calendar. The Christmas Schooner, a musical about a sailing captain who risks stormy waters to transport fir trees from Michigan’s Upper Peninsula to Chicago’s German immigrants in the late 19th century, was a yearly tradition at Bailiwick Repertory Theatre from 1995 to 2006. A musical adaptation of Hans Christian Andersen’s The Snow Queen cast a wintry spell atVictory Gardens Theatre from 2006 to 2009. 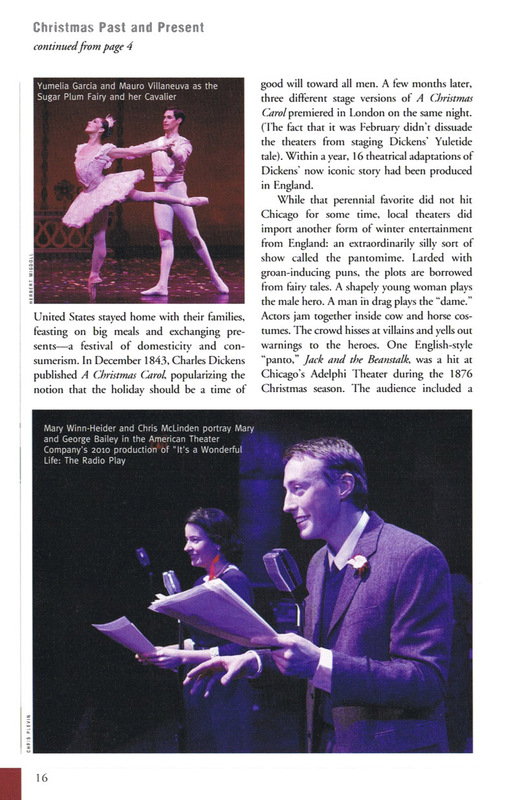 And for the past 10 years, the American Theatre Company has charmed audiences with It’s a Wonderful Life: The Radio Play, a stage version of Frank Capra’s 1943 film classic. Other theaters have taken an irreverent approach. Satirical holiday sketches are a staple at Second City this time of year, including a hilarious routine about Joseph and Mary seeing a marriage counselor. Several local theaters have staged Santaland Diaries, an adaptation of the David Sedaris essay about his experiences as a Macy’s elf (the aforementioned Crumpet). This year, The Building Stage is doing its own idiosyncratic version of the Scrooge story, calling it Charles Dickens Begrudgingly Performs “A Christmas Carol.” Again. And a musical adaptation of the popular 1983 film, A Christmas Story, comes to the Chicago Theatre. Not every Christmas play is as light and fluffy as snowflakes. 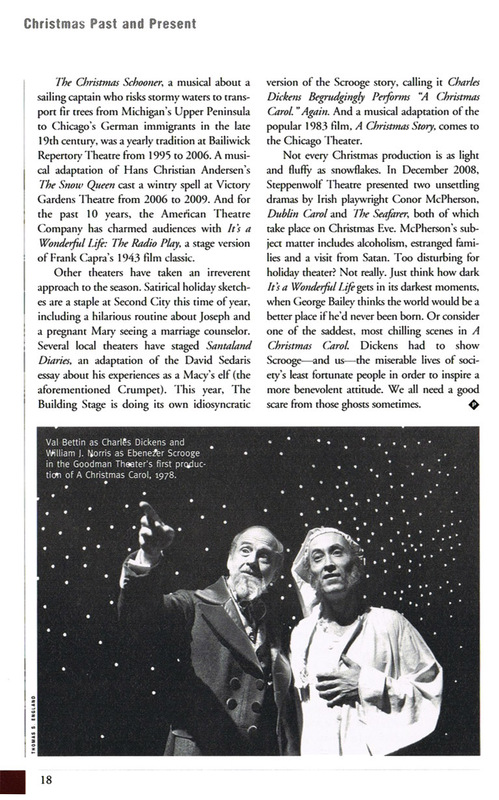 In December 2008, Steppenwolf Theatre presented two unsettling dramas by Irish playwright Conor McPherson, Dublin Carol and The Seafarer, both of which happened to take place on Christmas Eve. McPherson’s subject matter included alcoholism, abuse and a visit from Satan. Too disturbing for holiday theater? Not really. Just think how dark It’s a Wonderful Life gets in its darkest moments, when George Bailey thinks the world would be a better place if he’d never been born. Or consider one of the saddest, most chilling scenes in A Christmas Carol. Dickens had to show Scrooge—and us—the miserable lives of society’s least fortunate people in order to inspire a more benevolent attitude. We all need a good scare from those ghosts sometimes.